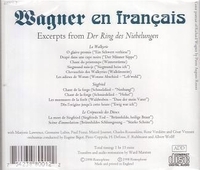 "WAGNER EN FRANÇAIS explores the defunct tradition of singing Wagner’s music dramas in French. There is a vast body of such recordings, and this issue, devoted to excerpts from the RING cycle, includes some of the best. A ‘Winterstürme’ from DIE WALKÜRE recorded by the tenor César Vezzani around 1932 is of surpassing lyric beauty. And snippets from the forging scene in SIEGFRIED sung in 1930 by the heldentenor Paul Franz are resoundingly potent. Yet the lustrous voice of the soprano Germaine Lubin will likely draw the most listeners. A celebrated French Wagnerian, she sings several selections on this CD, but her penetrating 1929 recording of Brünnhilde’s Immolation Scene from GÖTTERDÄMMERUNG is the most striking….For well over a decade, Ward Marston, of Philadelphia, has been a revered figure among collectors of vocal music. His sensitive CD transfers, clean yet brimming with color, have set new standards for sound quality."